Historically, dams have played an important role in livable communities. Dams have been used to generate power, reduce flood risk, run grain mills, provide irrigation, and store water. Dams and spillways also ensure consistent water levels for recreation and assist with nutrient storage. For decades, dams were a sign of progress and man’s ability to harness the power of nature. But due to safety and environmental concerns, along with a greater variety of energy options, that’s changing. “Dams must be installed and maintained properly. There’s also outdated, failing infrastructure to consider that’s often economically unfeasible to maintain or replace,” explains Wes Farrand, Civil Engineer for Snyder & Associates. In the U.S., there are over 90,000 dams, more than 400 of which are publically-owned in Iowa. Restoring or replacing dam infrastructure can cost taxpayers millions. How much does dam removal or modification cost? 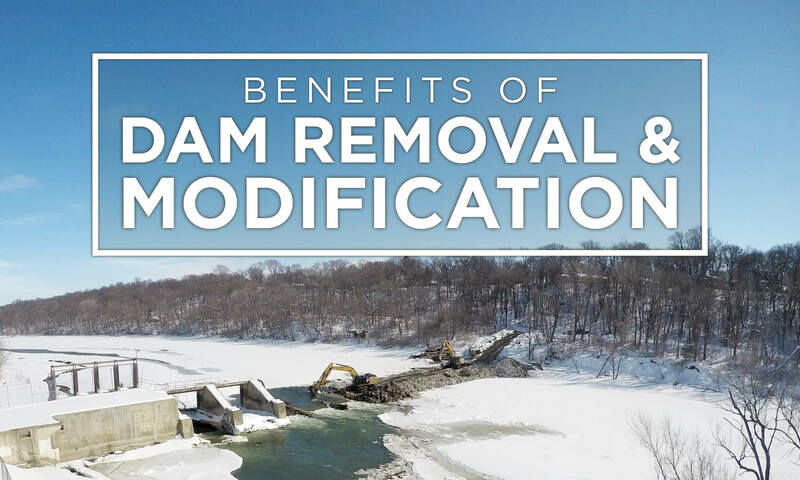 What are the benefits of dam removal? Should a dam be modified? What are the advantages? To help communities review their options and determine the next course of action, the Snyder & Associates team often conducts several public outreach events and meetings. “Exploring a community’s feedback for keeping, restoring, removing, or modifying a dam is very important, which is what we did while working with the City of Fort Dodge during the Central River District Master Plan,” shares Nichoel Church, Environmental Scientist with Snyder & Associates. There’s a direct relationship between the size of the dam, its complexity, and the cost to remove or modify it. A small earthen dam may cost tens of thousands of dollars to remove. Low head dam removal could cost hundreds of thousands of dollars. Large concrete dam removal could cost millions of dollars. Many funding assistance options are available through agencies and foundations that provide assistance for river restoration and dam removal/modification. A few examples include Clean Water State Revolving Fund (SRF) and EPA grants such as the Clean Water Act Section 319. With proper design and permitting, dam removal has extensive benefits for natural systems. Removing a dam that spans a waterway, such as a stream or a river, improves safety, recreation, and the environment. While the water upstream from a dam may look calm and smooth, the current is often too strong for boaters and swimmers, carrying them over the edge. The fall may not be fatal, but recirculating currents downstream from a dam can trap and drown a person. Deconstructing the dam removes the safety hazard. Smaller earthen dams will deteriorate. Without consistent monitoring and maintenance, they can fail. The large volume of water that releases when a small earthen dam fails poses a safety risk and can cause devastating damage downstream. The safety risk dams present is further illustrated with two recent projects. Prior to removal of the Hydroelectric Dam in Fort Dodge, Iowa, a young man lost his life after his kayak capsized. Tony Trotter, City Engineer for the city of Fort Dodge, says the accident solidified the decision to move forward with the dam removal project. When it comes to dam removal, the impacts outweigh the benefits by far. These impacts include human safety. Dam removal increases recreation in the water and adjacent to it. River length increases through dam removal, allowing boaters and kayakers to explore areas that were once dangerous to navigate. Anglers also benefit due to an increase in fish species diversity and longer migration lengths following dam removal. Leftover material from dams can be used to create new fish habitat in the waterway. “Modifying the Squaw Creek dam improved recreational opportunities for canoeing, kayaking, and fishing while making it safer,” states Klocke. Several dams across Iowa and the Midwest have been removed or modified to support whitewater recreation. Doing so brings in thousands of tourism dollars from out of town visitors. The City of Fort Dodge plans to incorporate the dam removal project into a larger river revitalization project. Kayakers and water enthusiasts will be able to traverse rapids north of the former Hydroelectric Dam, through the Central River District, and the area of the former Little Dam. The City is also working with Webster County Conservation to improve whitewater opportunities on Lizard Creek. Historically, dams were designed to control water, and the environmental impacts weren’t fully considered. Decreased water quality, disrupted cyclical stream temperatures, and altered natural meander of waterways are a few ways dams impact the environment. Dam removal improves water quality by allowing water to flow naturally. Natural flows allow for normal sediment load, increased dissolved oxygen, and reduced concentrations of oxygen. Fish and invertebrate species greatly benefit from dam removal. Many dams act as barriers because they were designed and constructed without passage for fish and invertebrates. Dam removal greatly benefits these species by allowing free passage upstream and downstream, which is crucial to migration patterns. In addition, a greater diversity of fish and invertebrate species is often documented both up and downstream following dam removal. For example, following removal of the Hydroelectric Dam in Fort Dodge, anglers will be able to catch flathead catfish upstream. According to Nichoel Church, the flathead catfish is a big river species that’s only been observed downstream from the dam. During a complete dam removal, rock riffles or series of large boulders are often constructed at the site of the dam to provide in-stream features. Benefits of these features include stabilizing channel beds, providing habitat for fish spawning, reducing velocities, and increasing downstream oxygen levels. Partial dam removal may be advantageous if full removal would release a significant amount of sediment. For a partial removal, the dam’s height is reduced, and the dangerous recirculating current is eliminated. Additional boulders or riffles can be added as instream structures to reduce downstream velocities. Following dam removal in Fort Dodge, the banks of the waterway will recover, developing natural riparian buffers and restoring floodplains. These new areas will increase the amount of natural terrestrial vegetation available and improve the ecology of the Des Moines River. “Dam removal allows for the natural depositing of sediment, which benefits the environment,” says Trotter. There are instances when the benefits of modifying dams outweigh a full dam removal. Dam modification is primarily for low-head dams, but it can also apply to other dams, depending on size, location, and condition. Dam modification reduces the risk of drowning by altering the vertical drop and cyclical undercurrents of the water. Dam modification means a portion of it remains in place at its current location but changes are made to the structure. Modifications may include changes to the river bed slope, upstream pool, or scour pool on the downstream side. Popular ways to modify a dam include rock riffle, rock arch rapids, rock ramps, and spillways. Rock riffle is rows of boulders and rock slope that are installed downstream to resemble natural rapids. Instead of spilling over the dam in a steep vertical drop, water descends gradually over the rock riffle. The dam still holds water to maintain upstream pools. On the Squaw Creek project, a water main located downstream was in danger of being exposed from erosion caused by recirculating dam currents. Constructing a rock riffle and low flow benches while stabilizing the streambanks rectified the erosion issue. Another way to modify a dam is to scale down its height to reduce the recirculating water effect. A rock and boulder complex is added upstream to develop rapids. Caution and awareness are still required while traversing the rapids, but the dam is no longer a hazard. Rock ramps are a cost-effective alternative to dam removal. To modify a dam in this manner, a rock and boulder complex is added to the scour pool on the downstream side of the dam. The additional rock fills in the scour to create a stable slope. The height of the dam may be lowered or not, depending on the height of the structure. Spillways can be modified to promote fish passage and prevent the spread of invasive species. For example, Snyder & Associates redesigned the spillway at Easter Lake to prevent invasive species from entering the lake during high water and flood events, while simultaneously preventing desirable fish species from leaving. Managing invasive species is both important both ecologically and economically. In addition to the spillway modification at Easter Lake, the project also included other improvements such as sediment basins, grade controls, drainageway improvements, mechanical dredging, fish habitat, fish rearing pond, and shoreline improvements. Dam removal or modification can provide significant environmental benefits to a watershed. Determining the correct course of action requires the appropriate level of documentation including river assessments, hydraulic modeling, and benefit-cost analysis. “Dam removal or modification shouldn’t be taken lightly. 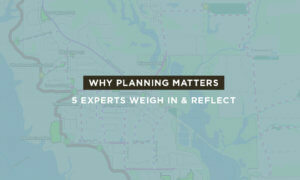 It requires research, planning, and critical thinking, along with an innovative approach to design. We’ve enjoyed assisting the City of Fort Dodge and Ames with their dam removal and modification projects and look forward to helping other communities,” concludes Jeff Walters, Environmental Sciences Group Leader for Snyder & Associates.